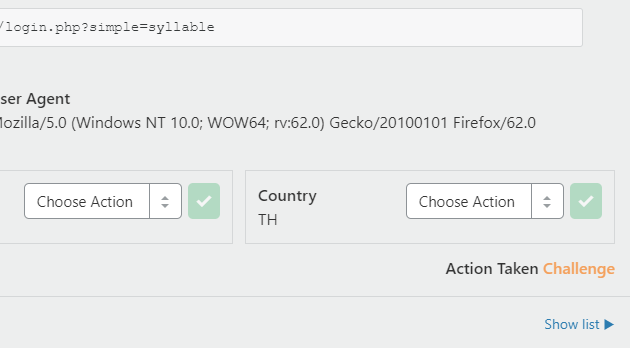 Firewall Showing 1,000's Of Strange GET Parameters Being Sent To Login Page? So I woke up today, and checked my Firewall Events on CloudFlare for my website like I do normally. Most of the time I'll just see thousands of failed SQL injection attempts, but this morning I was confused when I saw nearly 20,000 requests all coming from different IPs sending random GET requests with random values to my login page, here's an example of what it looked like. Ever single request from the 20,000 had different GET parameters with different values set. My best bet would be this was a failed DDoS attack, what do you think? This is almost certainly not a DDoS attack. The 1.10.188.0/24 block is a residential IP block in Thailand. A large number of the IP addresses in that range are known for forum spam. You can read a report for one of the IPs in your logs here. The weird parameters look like cache busters. By putting random words on the end it makes the request unique and prevents an old (cached) result from being returned. A lot of sites and tools use cache-busting for various things. My guess is that they're hitting sites all over the internet to look for forums and other chat features that they can then send spam messages to. Not the answer you're looking for? Browse other questions tagged firewalls ip ddos or ask your own question. Is it possible to track the email sent via BCC List using firewall or network security software?